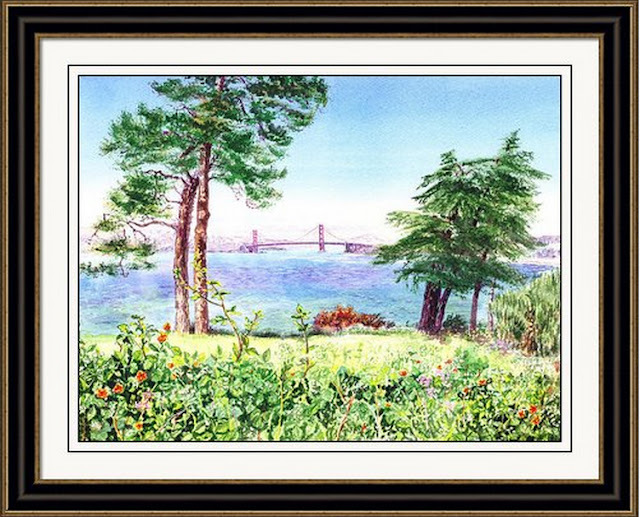 One of my customers ordered this commission painting of the gorgeous view of San Francisco Bay and Golden Gate Bridge. I have not realized at the beginning that the park was a famous golf course on a top of the hill. And that precise view was from 17th hole of Lincoln Park. I liked the idea that the given picture had good three points of visual interest plus the personal meaning to the customer of course. 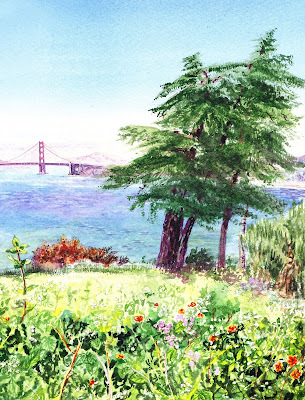 Starting the painting from the skies and the Golden Gate Bridge, I gradually moved to the foliage of the trees. 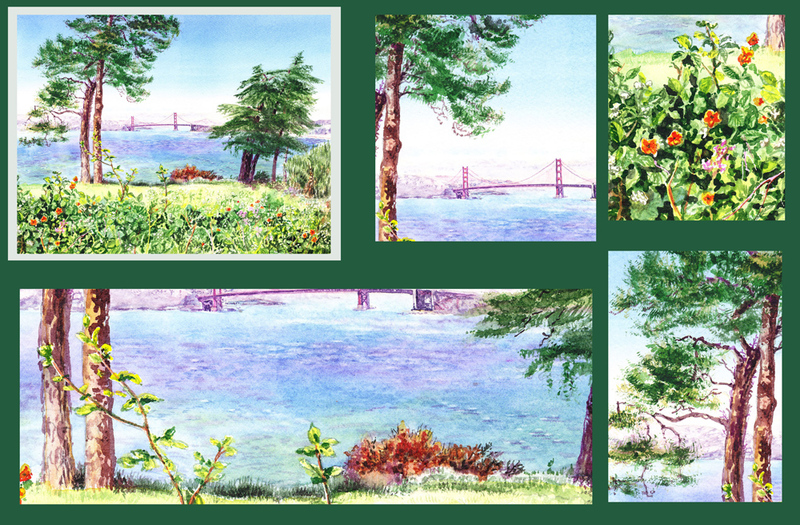 When these two backgrounds were completed, I continued with paining the bushes and the flowers maze in the front. They had to be painted with the most details; and, by the way, took me the longest time "to build". This little pink Lady named Rose was blooming in my garden a couple of month ago.. The morning Sun just hit the petals, and the background was still dark from the shadow of the fence. 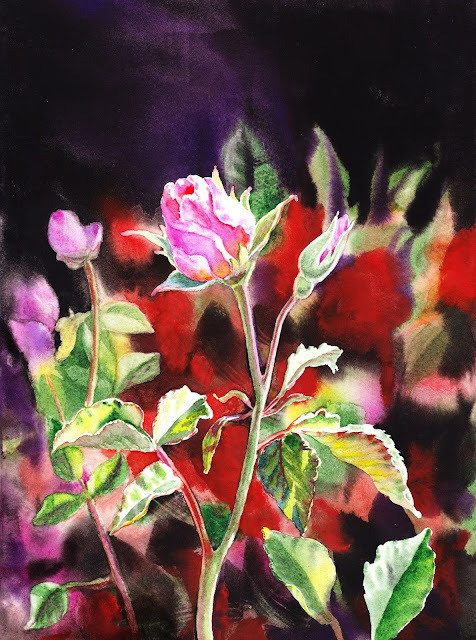 The challenge in this Pink Rose painting was that I wanted to leave the geranium on the background but keep it very vague, not popping-up so to speak. Instead, I wanted to make my Pink Rose shine. 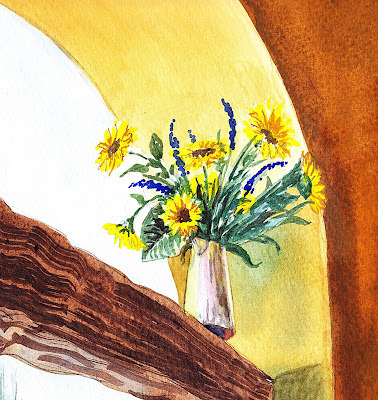 Any professional artist will tell you that if you want to have something on the back ground make it cooler than the front; and, vise versa: make the foreground warm to pop-up. 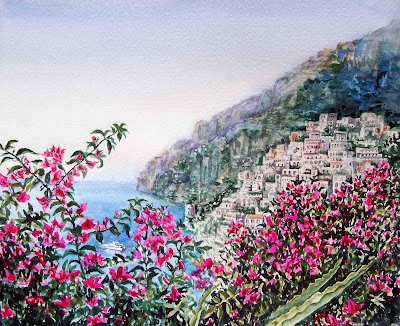 In this painting of the Pink (almost purple) rose everything is opposite to the usual rules: the rose color is cooler than the background colors. How did I achieve the contrast? I've loaded my brush with very juicy red. After masking the rose drawing, I've applied wet on wet technique, in several layers, until I was satisfied with the deepness of the red geranium. Then, I've painted the rose in a very light washes, ending the session with almost dry-on-dry application. 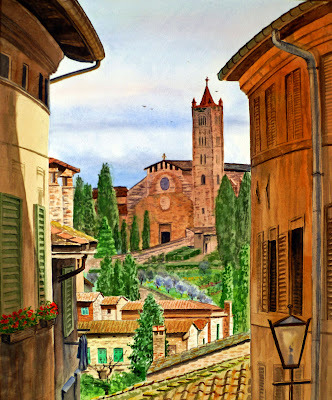 Oh Italy, I am excited to go there. So far I was just painting from the photo's of my friends and relatives. And now it is the time to meet this country in person. Here are my previous paintings. 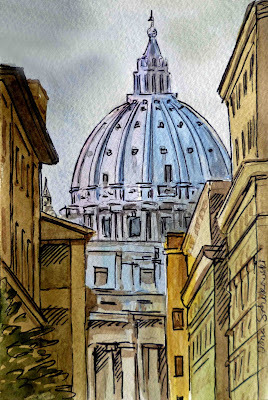 As this Summer I am planning on traveling to Europe, I've decided to practice sketching. The painting above is done outside in 90+ degrees with my new Travel Watercolor Pallet that I've created specifically for this trip. 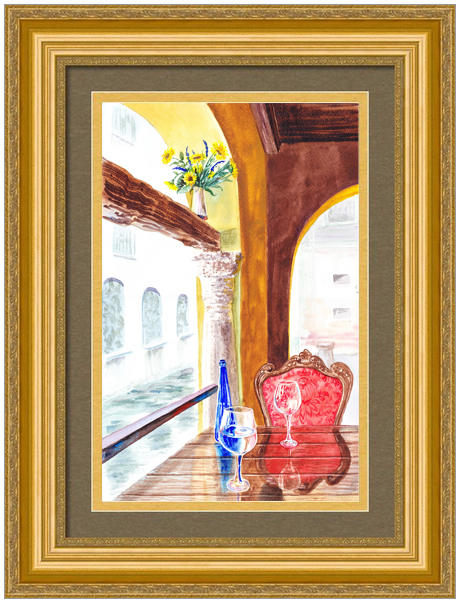 It was fun to paint Viano Winery combining only limited colors, and thinking about weight and comfort on my future trip. 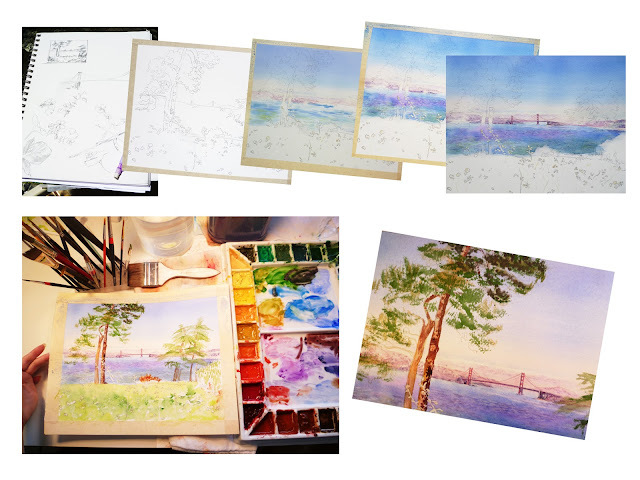 The new travel watercolor set weighs only 11 oz and will fit a small purse. With all the recent serious things such judging, writing for CWA, preparing for the shows, and meantime working on a couple of commissions; I really wanted to loosen up and make something just for fun. 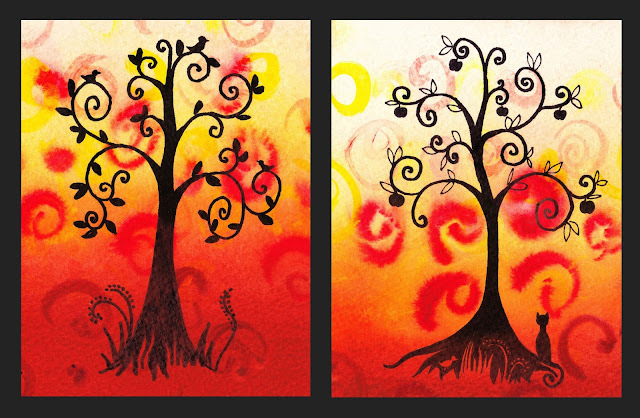 Here is my little Fun Tree of Life series. 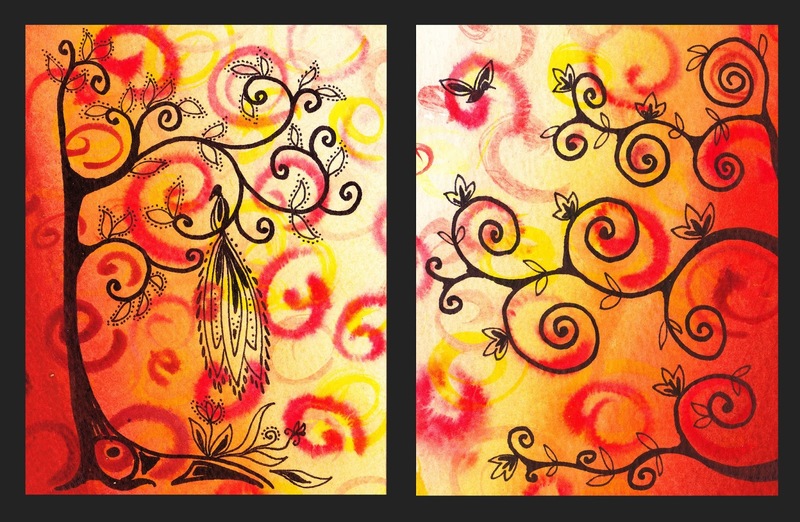 First, I placed some random swirls on Strathmore 140lb Cold Pressed paper, then I washed them off. Next, more swirls were coming, and more and more using dry-on-wet technique. 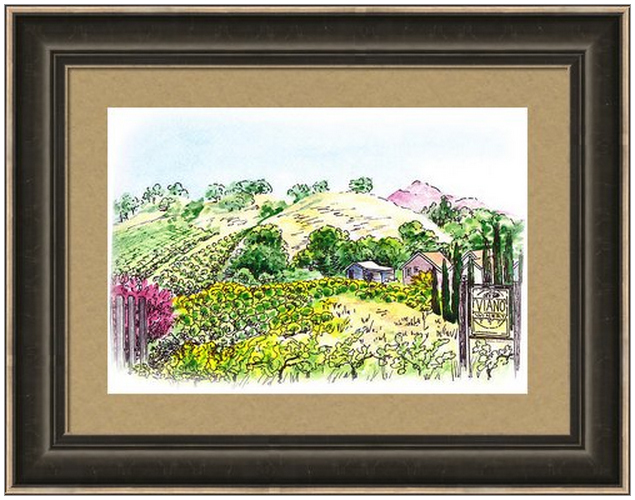 When this was done, I applied wet-on-wet nice juicy wash of rich colors such Cadmium Yellow, Alizarin Crimson, Burnt Sienna, and all what I felt is right for this project from my pallet. Here is when the fun came. When paper was dry, I looked at each swirl and it basically "dictated", moved my hand to where I felt putting the branches of the tree, plus a little cute additions to the trees that made it fun. 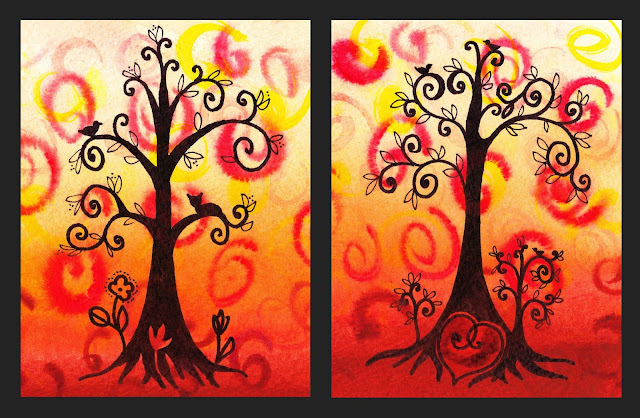 Impression I and Impression II (above) are all about birds and flowers. Oh, I am getting again too serious.. better stop and keep working!